Kollage Square® Crochet Hooks have a beautifully hand-crafted, American Maple wood handle. Each size comes in either a pointed or a round tip, giving each crocheter unsurpassed comfort in their craft. You asked for it, and now it’s here: Kollage’s Square Interchangeable Needle Set! These are some of the best interchangeable needles we’ve tried. They simply won’t come detached, until you’re ready to detach them — so you can trust all of your intricate projects to your Kollage set! Additional cords, tips, tools and end caps are available from our shop, so you can customize your set to your heart’s content! Please watch the video below to learn how to use your Kollage Interchangeable Needle Set! 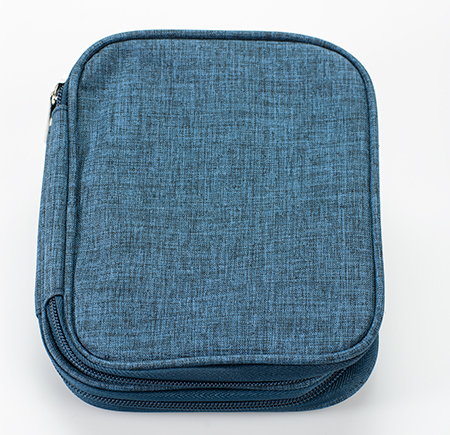 Kollage Square® Interchangeable Needle Set – Complete – US 2 through US 11, firm and soft cords in 24″, 32″, and 40″, two end caps, tweezer tool, and sturdy zipper canvas case with extra pockets and needle slots. 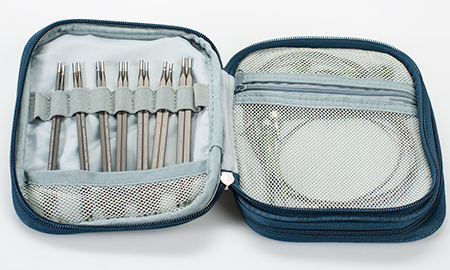 Kollage Square® Interchangeable Needle Set – Mini – US 4 through US 10, firm cords in 24″, 32″, and 40″, two end caps, tweezer tool, and sturdy zipper case with extra pockets and needle slots. Additional Tips for the Kollage Interchangeable sets. PLEASE NOTE: The 16″ cord only works with the shorter, 3.5 inch cord. Kollage Interchangeable Cord - Single - 16 Firm"
Kollage Interchangeable Cord - Single - 24 Firm"
Kollage Interchangeable Cord - Single - 32 Firm"
Kollage Interchangeable Cord - Single - 40 Firm"
Kollage Interchangeable Cord - Single - 47 Firm"
Kollage Interchangeable Cord - Single - 60 Firm"
Kollage Interchangeable Cable - Single - 16 Soft"
Kollage Interchangeable Cable - Single - 24 Soft"
Kollage Interchangeable Cable - Single - 32 Soft"
Kollage Interchangeable Cord - Single - 40 Soft"
Kollage Interchangeable Cord - Single - 47 Soft"
Kollage Interchangeable Cord - Single - 60 Soft"